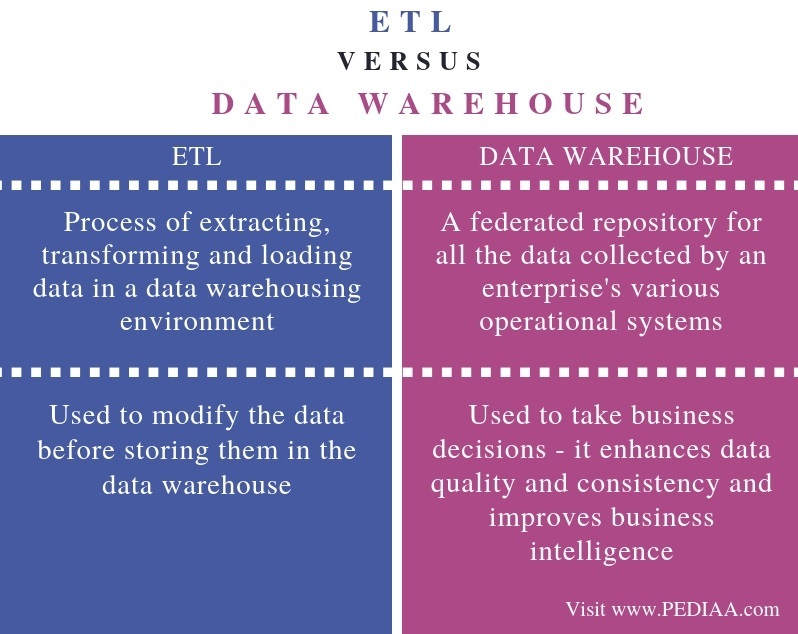 The main difference between ETL and Data Warehouse is that the ETL is the process of extracting, transforming and loading the data to store it in a data warehouse while the data warehouse is a central location that is used to store consolidated data from multiple data sources. A data warehouse is a system that helps to analyse data, report and visualize them to make business decisions. It is subject oriented, integrated, time variant and nonvolatile. However, there are several steps to follow before storing the data into a data warehouse. This process is called ETL. It involves Extracting data, Transforming, and finally, Loading them to a data warehouse. 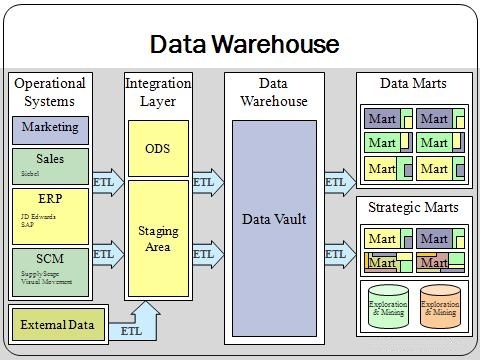 Therefore, the difference between ETL and Data Warehouse stems from this basic concepts. 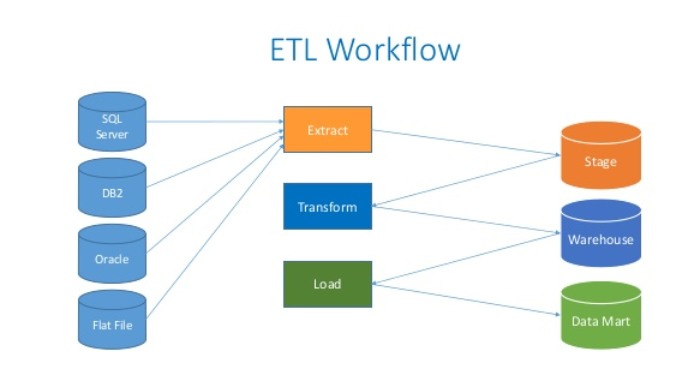 ETL stands for Extract, Transform and Load. In this process, first, the data is extracted from multiple data sources. Then, it is transformed and loaded into the data warehouse. ETL denotes this entire process. IBM Data stage, Informatica, and, Microsoft Integration services are some enterprise level ETL tools. Let’s now look at each step of ETL in more detail. Extraction is the first step. It involves extracting data from various data sources such as databases. One major fact to note while performing extraction is that it should not affect the performance or the response time of the original data source. Therefore, there are various data extraction strategies. Full Extraction – This involves extracting all the data from all the data sources. The main use of this strategy is to load the data warehouse at the initial stage or load it when it is difficult to identify the changed data. Partial Extraction (with update notification) – This strategy is easier and faster than full extraction. It involves extracting only the modified data. Partial Extraction (without update notification) – It involves extracting the data based on certain key features. For example, if there is already extracted data till yesterday, it is possible to extract today’s data and identify the changes in them. Major data transformation tasks are as follows. Calculating values – Calculating and deriving new columns from the existing columns. Spilt and merge fields – Splitting a field into multiple fields or combining several fields into a single field based on the requirements. Conversion of units of measurements – Involving data time conversions, etc. Summarization – Aggregating and consolidating the data. Deleting duplication – Deleting the duplicate data received from multiple sources. This is the process of fetching the prepared data and storing it in the data warehouse. There are various loading techniques. Initial Load – Loading the data warehouse for the first time. Incremental Load – Applying ongoing changes as necessary in a periodic manner. Full Refresh – Completely erasing the contents of one or more tables and reloading with fresh data. Data warehouse is a system that supports the business intelligence process. It converts the data into meaningful information for analyzing the business. Therefore, it is a valuable resource for the management of an organization in making decisions. Moreover, an organization has various databases such as MySQL and MSSQL. All these data are extracted, transformed, and loaded into data warehouse. Then, the data is integrated and processed. Finally, the data analysts, data scientists, and managers use this data to take business insights. Furthermore, data in a data warehouse is divided into data marts. Each of them contains data for specific users. They improve security and data integrity. Usually, a data warehouse is located in a separate location from the normal operational databases. ETL is the process of extracting, transforming and loading data in a data warehousing environment. In contrast, a data warehouse is a federated repository for all the data collected by an enterprise’s various operational systems. Thus, this is the basic difference between ETL and data warehouse. ETL is a process that is used to modify the data before storing them in the data warehouse. A data warehouse is used to take business decisions. Moreover, it enhances data quality and consistency and improves business intelligence. Hence, there exists a difference between ETL and data warehouse based on the individual usage. In breif, the basic difference between ETL and data warehouse is that the ETL is the process of extracting, transforming and loading the data to store it into a data warehouse while a data warehouse is a central location that is used to store consolidated data from multiple data sources. 1. “3 – ETL Tutorial | Extract Transform and Load”, Vikram Takkar, 8 Sept. 2015, Available here. 2. “What Is Data Warehouse? – Definition from WhatIs.com.” SearchDataManagement, Available here.